This might just be APOD of the Year. Wow! And a dot of Earth to boot. Fantastic APOD! I have a question though: I dont quite understand what's going on with the light of the rings in Saturn's shadow. If the backside of Saturn is being partially lit up by light reflected off the rings, why are the inner rings curved up so much, whereas the others seem aligned (with their rings light up directly by the Sun)? Any thoughts? Thanks! This is a wondrous image. To Stephinity . . good point, your comment made me look again at the picture. It looks to me like it may be some sort of a band in Saturn's atmosphere; it seems to be following the curvature of the planet rather than the rings. No idea why it shows up like this though. Perspective: That one thing which I think most lacking, most needed, in my country today. Remarkable image which leads to remarkable thoughts. The thin black band on Saturn is the night side equator...which is virtually unlit by the thin rings. North of the dark equator, Saturn is lit up by the bright ring structure that you see in the APOD. this is what you are erroneously calling the "curved inner rings." Last edited by neufer on Sun Sep 04, 2011 1:53 pm, edited 1 time in total. I am completely amazed. Thank you. Saturn, Saturn, my predilect planet. This image is beautiful, indeed. Some moons of Saturn have ice of water. It will can to be important in explorations in the future. And that pale blue dot! Wow; Ann would love that. Wow! Simply amazing. Thanks, Cassini team. This image alone was worth the cost of the mission. Thanks, neufer, for the explanation, but I'm afraid I still don't get it. Perhaps it's because I don't know what a night side equator is and can't find a good explanation. Any chance you could explain it? I agree with revloren, this could be the APOD of the Year. Thanks, neufer, for the explanation, but I'm afraid I still don't get it. Perhaps it's because I don't know what a night side equator is and can't find a good explanation. Any chance you could explain it? as obscured by just the A & B rings. While the two seem to have superficially similar structures they are actually quite distinct and they are clearly separated in the APOD near the outer edge of Saturn itself (as if someone had drawn a half circle in black marker around the bottom of Saturn). 2) a fainter obscuration due to the A ring. (that receives no light at all from the thin rings). Way Beautiful. Most totally excellent image. Do you suppose Earth is a crescent or full? Is Mars up there, too? Maybe way up in the upper left corner? This image testifies to the magic of reflection nebulae. Of course this image is supremely valuable as well as beautiful, since it represents a prespective that we can never have from the Earth. Speaking about the Earth, exactly where in the image is the pale blue dot located? I followed the link and saw a closeup of the pale blue dot, but where in the larger image can I find its position? "The Earth-and-moon system is visible as a bright blue point on the right side of the image above center. Here, Cassini is looking down on the Atlantic Ocean and the western coast of north Africa. The phase angle of Earth, seen from Cassini is about 30 degrees." APOD Robot wrote: in this exaggerated color image. The image you showed in your post is not the right side of the image above center. And the inset can't be from that image, since the inset is clearly in black and white. By the way, I did notice that today's APOD was produced from ultraviolet, infrared and "clear" filters, which means two invisible filters and one that won't show color. There can be little doubt, however, that the Earth looks blue from space, and if possible it should be shown as such, I think. Do you ever follow links? The link from APOD takes you to PIA08329, which in turn takes you to PIA08324, which is from the left side of the APOD. A magnified view of the image (inset) taken through the clear filter (monochrome) shows the moon as a dim protrusion to the upper left of Earth. Seen from the outer solar system through Cassini's cameras, the entire expanse of direct human experience, so far, is nothing more than a few pixels across. But then, you probably know better. The inset is from the right side (above center) of the image bystander shows. In both the insert & the image the Earth is clearly pale blue (not black & white). 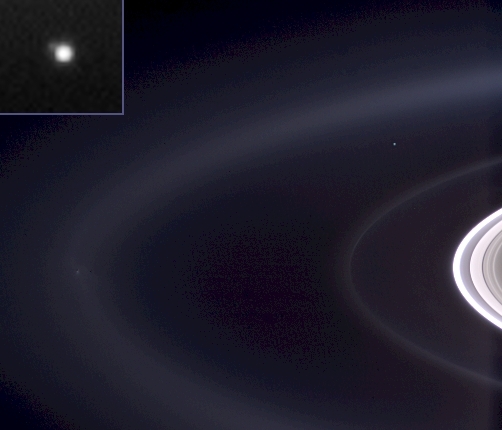 The Earth is a deeper color of blue in the enhanced color APOD image. if it had been looking down on the Pacific Ocean no doubt the Earth would have appeared bluer. Thanks neufer for the detailed explanation... it clicked in my mind and now I totally see what you mean! Simply Awsome!! It just happened that way? Thank you! This one is my all time favorites! I have this image in a large size [18" x 36"] hanging above my desk! Beyond cool!